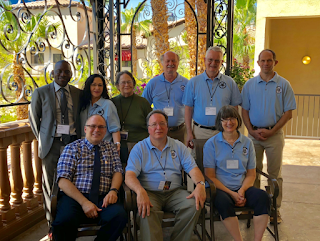 The Deaf and Hard of Hearing Ministries Committee of Global Ministries held its annual meeting in Las Vegas on July 25, 2018. The committee represents the varieties of its constituency: persons who are culturally Deaf, hard of hearing persons, late-deafened, Deafblind, and sign language interpreters. The purpose of the meeting was to review the past year’s objectives, discuss the committee’s progress, create strategies for some of the committee’s work, and to support an ecumenical Deaf ministry conference that included the members and leadership of the United Methodist Congress of the Deaf (UMCD), a United Methodist approved caucus. The Rev. 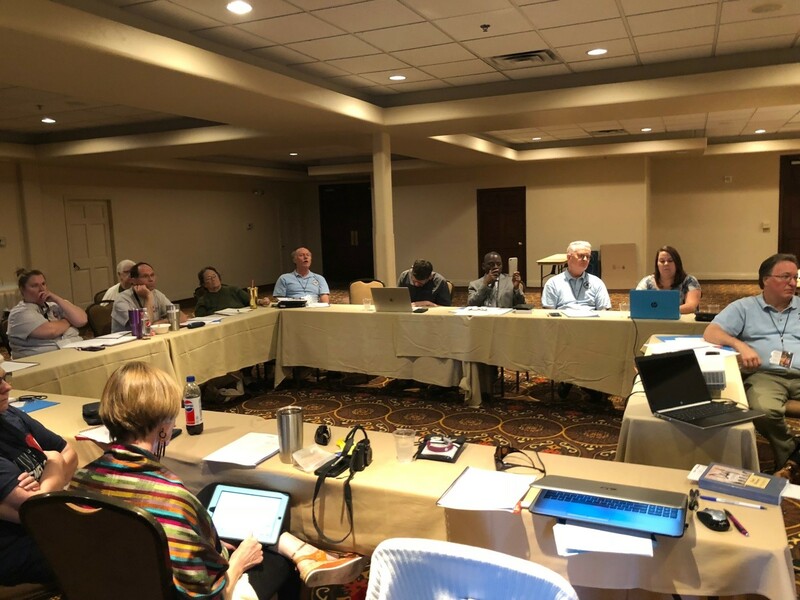 Dr. Tom Hudspeth, the president of the committee, invited the stakeholders to the meeting, such as the UMCD board and other United Methodists and guests from other denominations. Rev. Leo Yates, Jr., the consultant for Global Ministries, co-led the meeting with Hudspeth, as they engaged the committee members and guests. “There’s been a shift in how Deaf ministry is done and it’s critical that the committee stays abreast to this,” said Hudspeth. One concern that was raised was about the February 2019 special General Conference session and how it might affect the committee and its work if there is a new model or plan put in place. “Deaf people are praying about this too,” said Mary Deters, a guest from the Florida Annual Conference. The daylong meeting also included ZOOM training (an online video conference platform) which the committee believes can provide tutoring in American Sign Language (ASL) to churches that are interested in or wish to learn more about beginning a Deaf ministry. 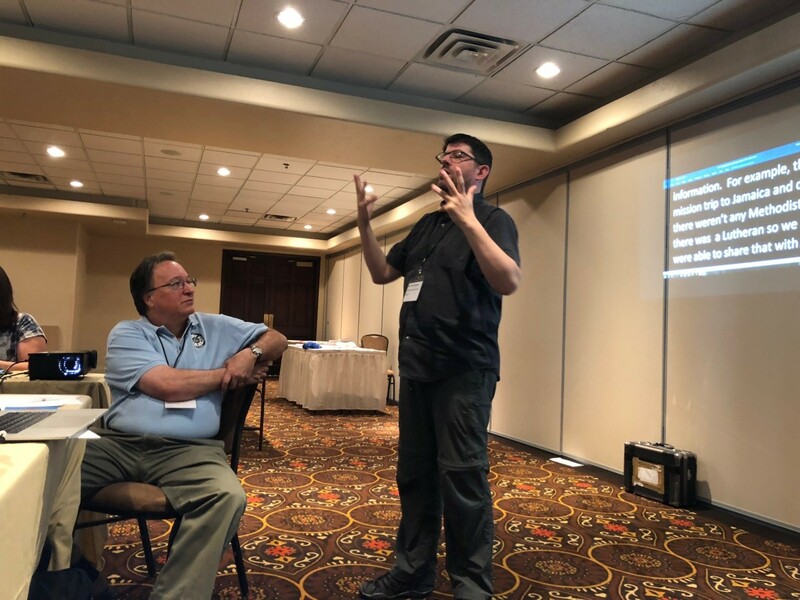 “It’s important the committee network and stay connected with the various forms of Deaf ministries and observe what the other denominations are doing,” said Yates. Part of the strategizing involved the development of Deaf leadership, which includes the committee approving the allocation of future grant funds. These will enable churches to hire Deaf or hard of hearing persons to oversee their Deaf ministries, by providing a stipend for their work. Another activity will support Deaf Certified Lay Servant training developed by Carol Stevens in collaboration with the Global Board of Higher Education and Ministries. Another strategy is the implementation of orientation to Deaf ministry for churches or ministries that receive grant funding. “Helping with an assisted listening system is good, but teaching them about how to serve in ministry with persons who are hard of hearing or late-deafened is better,” said Carol Stevens, a long-time Deaf ministry advocate and the vice president of the committee. Another strategy to support the church is the creation of a training module that assists individuals and churches with implementing a Deaf ministry. This will be taught by resource persons. It was also decided that the UMCD president will become an ex-officio member of the committee so the collaboration can continue and the committee can see where they may need to provide support. Much of the afternoon session focused on the work of the UMCD. This was led by the caucus president, the Rev. Kirk VanGilder, an elder in full connection who is Deaf. Committee members joined small groups and provided input and support for the envisioning the work of the caucus going forward. With the shift in the Deaf community and more younger generations of Deaf and hard of hearing persons being mainstreamed in public schools instead of Deaf residential schools, UMCD is committed to adapting to better serve its constituents and stakeholders. More Deaf and hard of hearing children and youth are not going to state residential schools like they did decades before, where they were in community with one another. 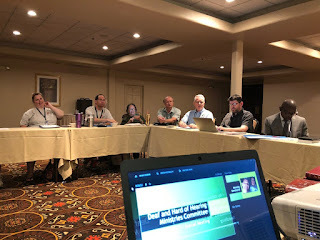 Connections and networking with hearing churches where there are one or two persons or Deaf families is one aspect of the direction where the work of the committee and the caucus are headed. Relationship building and community is an important feature of Deaf culture, but so is accessibility. Yates shared with the committee about the creativity of some Deaf ministries who have received grant funding, which included one ministry program that connects a Deaf church with the Deaf community that surrounds them. “Sometimes, relationships begin with the connection with a church’s ministry program before the connection with a worship community,” said Yates, as he described the (Deaf) older adult ministry that invites guest speakers who present on various topics as it pertains to Deaf and hard of hearing seniors. At the conclusion of the committee meeting, members joined together in a circle and prayed for one another, for Deaf ministries, and for the denomination. The need is greater than most of us realize. I trust churches will make this a priority.